Who are the Beifong sisters' fathers? AvatarSpirit.Net > The World of Avatar > The Legend of Korra (Moderators: Zubby, avatardestiny, Spiritwhisperer) > Who are the Beifong sisters' fathers? Re: Who are the Beifong sisters' fathers? ^ I'd think that if Baatar was Sokka's son, Tenzin, Lin, Kya or Bumi would have long since mentioned something about it. Considering the lack of character interaction between various secondary characters, I doubt it. ^ Still not a excuse. Even Lin would have said something about them going to Zaofu, and when they were at Zaofu itself. Su herself would have too. 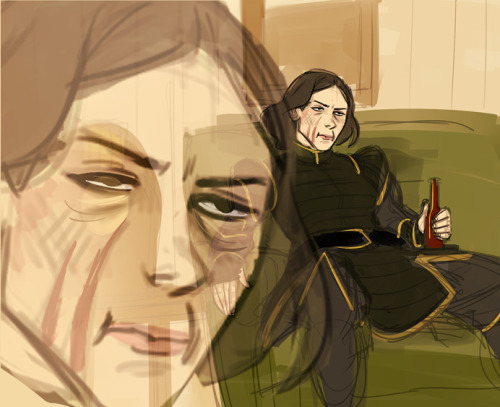 There's nothing in LoK that rules out Sokka as Suyin's father. It just requires that either Sokka be characterized as a deadbeat dad who didn't give two shakes for his daughter, or Toph be characterized as having literally stolen Suyin from Sokka by not telling him that he could be the father. I'm not sure which I like more. Probably the first. It's shipping, go along with it. Don't question it and definitely don't try to make any sense of it. Is it really important who the father or fathers are? Actually, yes, when I think about it. If we knew who they are Toph would seem less like someone with "very loose morals" and a bad person in general. Imo, the only thing awesome about her are her battle skills. She's been a brat since she was young and she's become only worse with age. It may not be important to the story, at least not now, but it is important to Lin and Su. Not having their fathers in their life did affect them, remember Lin still held it against Toph after all those years. If we knew who they are Toph would seem less like someone with "very loose morals"
I strongly disagree with this. If she was a guy no one would call him that and everyone would pity him for having two dead wives. Yet, when she's a woman, no one considers it likely that maybe she has two dead partners (whether they were married or not) or they abandoned her and everyone either comes to the conclusion that she either didn't tell them about the kids or was sleeping around or similar. I guess my annoyance with Toph blinded me, I never liked her much to be honest. She seemed to me when I watched the show that she simply doesn't care about who she hurts and how. The fathers matter so little in her eyes that she feels no need to even mention them. Thanks for correcting me though, now that I re-read what I said it does sound wrong. Should have put more tought in the post. I can understand that. Toph is a very "hit or miss" character. However, it's also possible that they mattered a lot to her and I could see her not wanting to talk about them as her not wanting to be reminded of painful memories. Her tough attitude just makes her look like she doesn't care but it could be just her way of dealing with grief. It's kinda in the Bei-Fong family to dwell on past until it chases them down. But regardless of her own feelings she should have put them aside for her daughters. They had a right to know who their fathers were even if they wouldn't be in their lives. No one is arguing against that. But Toph isn't a perfect human and she's rather selfish so I'm not surprised she put her own feelings over her daughters'. I'm still not clear how much Lin knew about her father. In her outburst, she simply says she didn't know him, with no embellishment, leaving us to assume that she didn't even know who he was. Then Bolin asks about it, and Toph gives the name out nonchalantly. Did Lin simply never ask? Had Toph chilled since she last saw Lin, and wouldn't talk about it all before but now considers it no big deal? Did Lin know her father's identity all along, and was simply referring to not having a real relationship with him? The answer we got just leaves me with more questions. Or maybe Toph just trolled Bolin.... Nah, that would be sooo out of charact... wait... actually, scratch that. Considering Lin's disposition towards her family ("Leave your maturity behind and enter the Grudge! "), she probably never asked and Toph never cared to talk about it either. 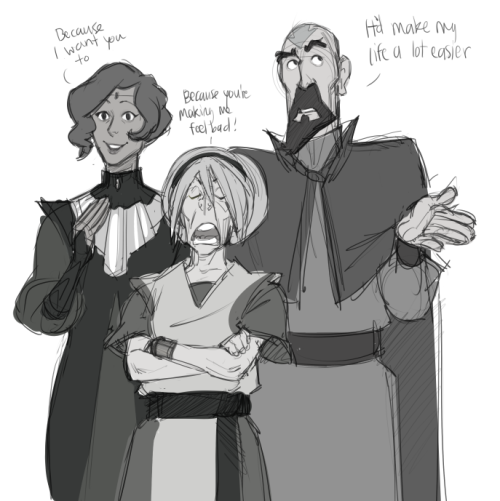 That would be hilarious if every time she was asked, Toph made up a new name. There's still a lot of Pokemon regions to use. ^So that means Toph's motto with men was: "Gotta catch 'em all!" ? I like how the resolution to that was just like, "well I know I've been a crappy parent, but if you don't hate me too bad I guess it's just fine." I mean Lin had legitimate concerns there that were never addressed, but she's being made to look like a sourpuss that just can't get over stuff. And for it to be just brushed off like that, just left a bad taste in my mouth. it's like, she had legitimate issues with not knowing who her father was, it seemed like she had asked about it before but Toph never wanted to tell her anything and just casually talks about it when Bolin asked. It was basically the equivalent of a child having issues with something like that and their parent just telling them to get over it. Excuse me, parent and sister. one might argue that the show didn't want to get too deep into that type of thing but come on, they freaking showcased a murder, I'm pretty sure single-parent issues wouldn't have been that much of a problem. Or at the very least actually address Lin's concerns and not make it seem like it was just a problem that she was having. I mean she had every right to be done with Toph if Toph was just gonna sit there and continue to act like it was simply a problem that Lin was having with her and not her just being not the best mother. I mean yes she acknowledged such, but that doesn't make it okay. That's like a hypocrite acknowledging the fact that they are being a hypocrite but still trying to tell you not to do something that they themselves did. Simply acknowledging the issue doesn't make it fine all of a sudden. Someone on tumblr said Lin was almost a 'forgiveness-dispenser'. I'm wondering if Lin has any recollection of Su's father, but she might have been too young to remember or he may have never lived with Toph before Su was born. I have to agree here. This was my problem with how Lin was treated in every book. It was like everyone was always telling her: "Get over your justified anger because it's getting annoying and I already got over hurting you.". I don't think any of those issues were handled well. Book 1 was he closest to handling it well because Lin was partly at fault but with other cases, it was just messy. The one with Toph was probably the worst because she proved that she was a bad mother by treating the fact like something people should just get over/forgive. If she truly realised her wrongdoings and wanted to atone for that she would have done more. I don't mind this portrayal because people have faults and one of Toph's biggest faults was selfishness so I'm not surprised it followed her her whole life. But by no means am I ever going to agree that her "apology" was handled well. Who cares, the writers obviously don't. But the fandom cares about missing parents A LOT. Remember the good times when everyone, from Avatar leet to noob, was speculating about Ursa and her whereabouts, true identity and what not? I think Bryke remember well, that's why they repeated the success formula so as to trap us for a while longer in their wonderful world. Yes, the fandom does care, the fandom cares about a lot of unimportant things. 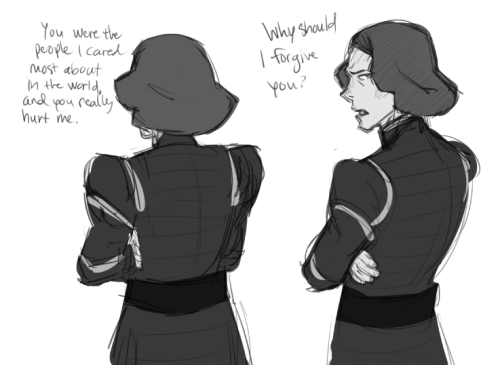 The Beifong sisters' fathers were simply irrelevant. Personally, I think it would have been way better had Toph not been alive. With this, it would have made way more sense for her sister to be all like "well you should get over it". You can't really properly forgive someone who isn't around to give a proper apology. With Toph being alive however this just makes her character look all around awful. If it wasn't for the straight nostalgia and love for the character from the first series, I think I would pretty much loathe her. I understand character flaws, but some flaws don't always have to persist. At a certain point, it just seems like she can get away with it because she's Toph. This shouldn't be true at all, it shouldn't just be brushed off just because she was selfish in the first series. I'm not saying that is what you're saying, but it's how some fans treat it. ^ Yeah, but it's not like she got away with being a very lax mother who used no authority on her kids because she herself absolutely loathed being caged in by her parents. She's a hermit in a swamp filled with regrets. She's been wanting to patch things up with Lin for years.